Since taking office eighteen months ago, President Donald Trump has proven himself beyond a doubt to be the most pro-Israel president in American history. However, even close friends with the best of intentions at times need a gentle nudge to realize that their approach needs some realignment. Trump’s statements about Israel at a campaign rally last night in Charleston, West Virginia, suggest that this might be the case. Speaking to the crowd, Trump exclaimed that Israel will pay “a higher price” in negotiations with the Palestinian Authority due to his historic decision to move the U.S. embassy from Tel Aviv to Jerusalem and recognize Jerusalem as Israel’s capital. Trump further said that because of the Jerusalem move, the Palestinians “will get something very good” in future negotiations. Trump’s Jerusalem decision will go down in history as one of his greatest accomplishments and a move that itself advanced peace in the region. Israel should not need to “pay” any “price” for the U.S. recognizing the reality that Jerusalem is and has always been the capital of the sovereign nation of Israel. When Trump talks about Israel having to “pay a higher price,” the U.S. president might do well to recall that Israel has proven throughout the decades of ultimately fruitless negotiations that the Jewish state has always been willing to make painful compromises for Palestinian promises of peace. In previous U.S.-brokered talks, Israel was ready to give up most of the West Bank, divide Jerusalem and even reportedly offered arch terrorist Yasser Arafat the Temple Mount — Judaism’s holiest site — during the Camp David Summit in 2000. The Palestinians turned down every previous Israeli offer of a state, usually meeting each major proposal with an orchestrated campaign of terrorism targeting Jews. And herein lies the most dangerous problem with the line of thinking expressed last night by the U.S. president. Trump’s comments, as well as the entire forthcoming White House Mideast “peace” proposal, rests of the foundation of one glaring falsehood — that Israel has a partner for peace in the Palestinian Authority. In talking about Israel paying a “higher price” and the Palestinians getting “something very good” in future negotiations, Trump is assuming that there is a Palestinian leadership that can be trusted with taking over strategic territory and using the land to build a nation at peace with the Jewish state. This assumption is contrary to the overwhelming evidence that the Palestinians will use any future state to continue their stated goal of destroying Israel. It should be obvious to any casual observer that the emperor has no clothes in the case of the Palestinian Authority, which uses its official organs to incite violence against Israel and refuses to stop paying the salaries of imprisoned terrorists and their families. A Palestinian leadership that regularly promotes the delegitimization of Israel, won’t come to the bargaining table and is led by an extremist, Mahmoud Abbas, who only this past weekend called for supporters to “keep the ground aflame with popular resistance” (“resistance” is a common Palestinian euphemism for terrorism) against Israel is not interested in making peace with the Jewish state. 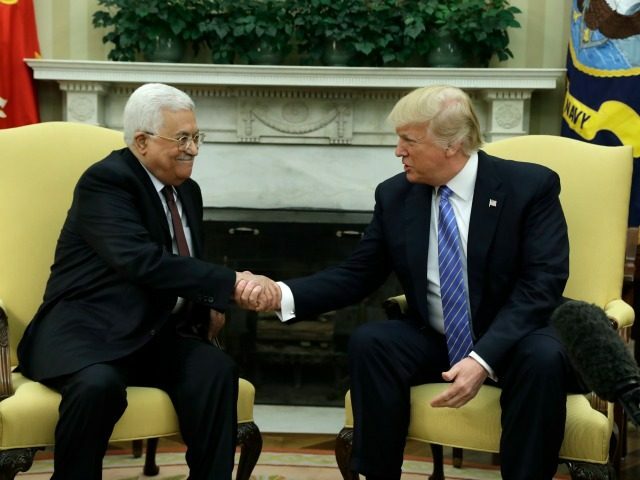 Besides the misplaced acceptance of the PA as trustworthy partners for regional peace, Trump’s statements seem to entirely ignore the other basic reality that about half the Palestinian arena is led by the Hamas terrorist organization. Indeed, Israel’s disastrous unilateral 2005 evacuation of the Gaza Strip, which paved the way for Hamas to take over the coastal enclave, is the perfect example of why the Palestinians cannot be trusted with territory under any future deal. Instead of utilizing Gaza to build a constructive society, the Palestinians immediately turned the Strip into a staging base for rocket attacks aimed at Israeli civilian population zones. Hamas has since launched two major wars and multiple massive terror campaigns against Israel using the Gaza Strip. There is evidence that Hamas’s popularity has only been growing in the West Bank, which might account for Abbas’s abject refusal to hold an election there for over eleven years. Just like Gaza, any future Palestinian state in the West Bank will serve to further destabilize the region and threaten America’s staunch ally, Israel. Trump clearly has the best of intentions toward Israel as evidenced by his moving the U.S. embassy, recognizing Jerusalem, standing up to anti-Israel bias at the United Nations and repeatedly affirming Israel’s right to self-defense, including backing Israel’s defensive actions to counter Hamas’s continued murderous assault against Israel’s border. Trump should maintain this support and advance the cause of true peace by adjusting U.S. foreign policy to account for the indisputable fact that there is no Palestinian partner for peace.